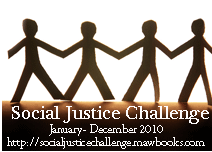 The Social Justice challenge was a really great one; each month the hosts assigned a different topic for us to read about. Congrats! I would love to do this challenge next year, if it continues. I somehow missed it this year. Good for you! I'd planned to do it this year....Not sure what happened, but I completely skipped this one.